This hotel is in the most beautiful location, right on the beach and within walking distance to lots of lovely bars and places to eat. The room was really clean and modern and the staff were helpful when you needed something. the door separating rooms was quite uncomfortable. Noises were heard from the adhearent room. The location is great. Is like 5 min by tuk tuk from el nido town and is more peaceful and In front of the beach. Also there are a lot of restaurants around. We stayed and the sunset view room. It was great. The bed is so confortable. The breakfast was really good. I loved the banana pancakes. It was clean and the tv signal works perfect, I had to spend 2 days in my room because of a typhoon so check the weather. It was close to booze and belly, which had food, WiFi and friendly staff. Three things eco suites did not. Our stay in Eco Hotel was perfect, and they even let us bring our dog Rocco :) We drove from Puerto Princesa for a visit. The establishment is clean, accessible and so cozy. The three of us would hang out by the hammocks and just chill together. Breakfast was filling and the wifi fast in the reception area. Great restaurants around (my fave is Altrove, the Italian one) and other local shops, like an organic store with sunblock and lotions. First and best pet-friendly hotel in El Nido that we've found, we can't wait to come back! Homemade type Filipino Breakfast was great.. basing from the previous reviews, they may have improved a lot on their menu and service. Yum! Location location location! Right by the island tour departure and arrival. Room was great with eco friendly features. I loved the breeze from the beach by their hammock that lulled me to sleep on a rainy morning. If you have limited time, this is the best location hotel. Suites by Eco Hotel El Nido This rating is a reflection of how the property compares to the industry standard when it comes to price, facilities and services available. It's based on a self-evaluation by the property. Use this rating to help choose your stay! Set along Corong Corong Beach, Suites by Eco Hotel offers accommodations in El Nido, 12 mi from Matinloc Shrine and 14 mi from Nacpan Beach. 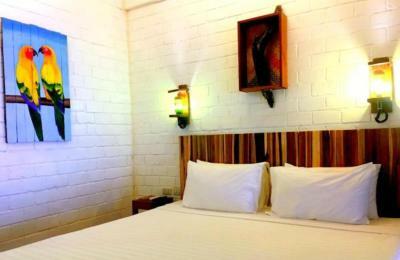 All room at Suites by Eco Hotel El Nido are equipped with air conditioning and are furnished with up-cycled furniture. 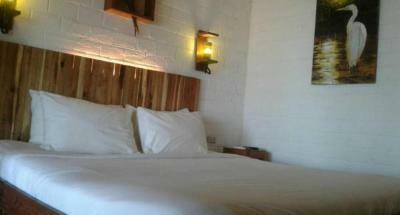 The rooms come with a flat-screen cable TV and other units feature a terrace with a hammock and outdoor furniture. The private bathroom has a shower and toilet with a bidet. Free toiletries are also included. Selected unit offer views of the sea. Guests can relax on the beach or by the garden and enjoy the natural landscapes El Nido has to offer. A luggage storage is available at the property while airport shuttle services can be arranged at an additional charge.There is also a 24-hour security at the property. El Nido Public Market is 0.6 mi while Papaya Beach is 1.7 mi away from the hotel. The nearest airport is El Nido Airport, 4.5 mi away from Suites by Eco Hotel El Nido. 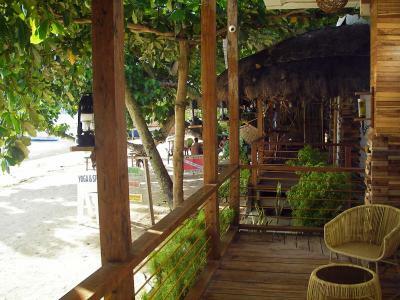 When would you like to stay at Suites by Eco Hotel El Nido? This double room features a terrace with a hammock that has a view of the sunset. The room is equipped with air conditioning, a flat-screen TV, and a desk. The room is also furnished with up-cycled furniture. This room is fitted with air conditioning, a flat-screen cable TV, and a private bathroom with a shower facility, a bidet, and free toiletries. 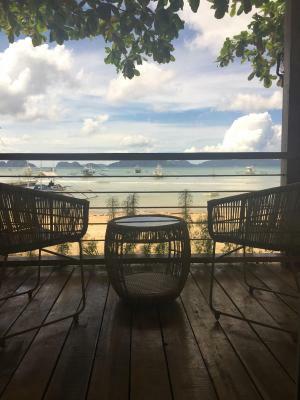 Featuring a private balcony with views of the sea, a hammock, and up-cycled furniture, this air-conditioned room has a desk, and flat-screen cable TV. The private bathroom comes with a bidet and shower along with free toiletries. 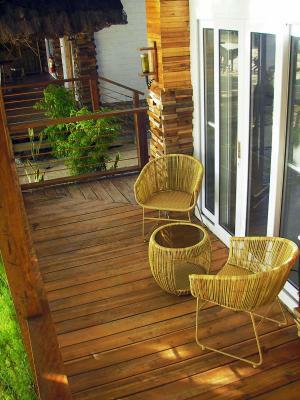 House Rules Suites by Eco Hotel El Nido takes special requests – add in the next step! Please inform Suites by Eco Hotel El Nido of your expected arrival time in advance. You can use the Special Requests box when booking, or contact the property directly using the contact details in your confirmation. There was quite a lot of noise early on in the morning due to building work nearby and service at breakfast was quite slow - there were regularly piles of dirty plates left piling up on the side. There was a bit of a funny smell in the bathroom. Close to beach, close to restaurants and bars, clean room, good breakfast, felt safe. We left without collecting our deposit and they returned via a money transfer which was great! Breakfast wasn't the most organised but it was still tasty. Location was amazing - so close to the beach and loved Pops District. The breakfast was very basic with not many options.I don’t understand how the hotel is eco more so than any other hotel e.g towels being changed daily. There was no hot water but maybe that’s an eco thing.There was a huge suspicious dirty looking stain on our curtain. Upon arriving you are asked to sign a contract - one of the terms read that the ‘noise due to construction nearby is not under their control’ - be prepared for drilling and hammering from 07.30 am onwards. It’s relentless and goes on well into the afternoon. There were people digging soil and hammering nails into the wall right next to us at breakfast. I’m meant to be on holiday. What is interesting, is that the contract is there to sign AFTER they’ve taken the non refundable payment from your account for your stay. Within the contract, it also explains the fact that the water is temperamental. Again AFTER you’ve already paid. We managed one satisfactory shower in the 5 days we were there and the power is woeful. The water is either scolding hot, ice cold or has zero power. The tap on the sink was broken (swinging from side to side)and only worked 50% of the time and the shower was full of rust. There was a continuous leak from behind the toilet and the intermittent smell of sewage coming from the bathroom was vile. The pipe under the sink in the bathroom also leaked. We stayed in Aqua Travel Lodge before this - which is literally central to El Nido and paid £25 a night. And honestly, we wished we’d stayed there. The shower was warm and there wasn’t a horrendous stench from the toilet. WiFi is very unreliable - but that’s permissible. It’s an island and to be fair, I’m not here for the Internet, but just FYI. Poorly constructed bathroom (cracks everywhere) means the place is running with ants. Again though, I can pass that - we’re in the tropics. The front door didn’t close properly (see pics) and both bedside lamps were out of service. There isn’t even a chair in the room to sit on. I completely recognise that due to its island location, amenities are not as easy to come by as what you would expect on the mainland. However, it is wholly unjustified to advertise a property as 3 star and charge a price to reflect that, without meeting the criteria. Pops District, where it’s located is a nice spot for dinner. Hotel is right on the beach.